Grant Pope, right, with business partner Zach Frauhiger. Grant Pope, a Kirkwood High School graduate and former Tesla employee, was sitting on his porch drinking a beer when he had an "aha!" moment about a solution to tangled phone and headphone cables. Pope and his business partner Zach Frauhiger had been talking about how annoying it is when they are on a hike and their cords get knotted, or when their co-workers steal their phone chargers because every cord is pretty much the same color. Then it clicked. "This is so personal for us," Pope says. "We were sitting there like, 'This makes the most sense.'" Pope and Frauhiger launched eleWraps in October 2017. The devices are a subtle little plastic wrap protector for your phone or headphone cable. The plastic helps keep your cord from breaking and doing that thing where, in Pope's words, "it only charges when you move the cord like this." Their many bright hues also help distinguish your charger from others so that when your pesky friends and coworkers "borrow" your charger, they don't mistake yours for theirs — yours, after all, has a colorful eleWrap around it. Growing up in Kirkwood, Pope didn't always plan on starting his own business. After he graduated high school, he went to Purdue University in Indiana to snag a degree in economics and mathematics, parlaying that into working for Tesla and Gusto in his twenties. When he got married, he wanted to strip life of its worries, quit his job and move to Denver with his sweetheart. And that's exactly what he did. "That was a big moment, everyone thought we were crazy," Pope says. "It took a lot of long conversations with the wife." Now, at 28, he works on his company eleWraps full time with his business partner in Denver. "You can't put your all into everything when it's a side hustle." Pope says. 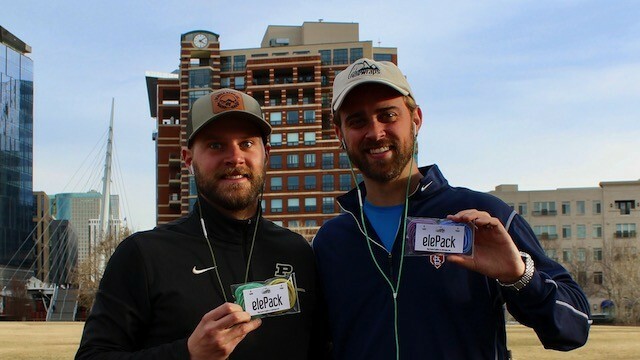 eleWraps are now being sold online on the company's website, and to a test market in Denver. They are working on getting their product in gas stations first to test the waters, then to the big boys like Walmart and CVS. In the meantime, they are working on an Amazon store. One of their goals is to be as cost-effective as possible. The best part? Free shipping. "We spent a lot of time on Amazon just researching, and most good quality cord protectors were around 30 to 40 bucks," Pope says. "And the cheap ones were bad quality and I would literally watch it fall apart before my eyes." The two main products on their website are elePacks with two audio eleWraps to wrap a single pair of headphones and one power eleWrap to wrap a single phone-charging cable. On their website, you can buy four of these elePacks for less than $25. "We are not just solving a problem," Pope says. "We are making things more colorful."